You may have heard about the recent introduction of 100 per cent Hunter Valley wines in-terminal at Newcastle Airport. But did you know we also have a large range of souvenir and food products sourced directly from the Hunter too? Here are five of our favourites available right now at News Travels. Started by two sisters in the Hunter Valley, over 15 years later Hunter Valley Cookies has expanded to Sydney, Newcastle, and the Central Coast. Producing thousands of cookies a week, the local company still retains their humble roots and family tradition, employing family members down the generations to hand-craft every cookie. At Newcastle Airport, you’ll find a wide range of these delicious cookies, from the classic chocolate chip to the cheekily-named rainbow coloured ‘unicorn poo’. There are even gluten-free options. Need a gift that isn’t typical and shows Newcastle’s fun and unique personality? Try a Newcastle Productions souvenir! All designs are drawn by Novocastrian Trevor Dickinson, whose quirky illustrations of Newcastle’s iconic landmarks have seen his work exhibited in galleries nationwide. At News Travels, you can get your own piece of Dickinson art in the form of a magnet, post card, tea towel, or even playing cards. and processed on-site in Denman, ensuring you get the freshest products year-round. Discover a new world of flavour with News Travels’ extensive selection of Pukara Estate jams, tapenade, dukkah, olive oils and more available in multiple varieties for nearly any taste. Pukara Estate olive oils are also used for cooking at Epicure Kitchen and Broughton & Bay Bar. News Travels employee Sue with her favourite Rocky Road House flavour, White Cranberry Close. Pamper yourself with all-natural Fleurette Aromatherapy products. At News Travels you’ll find limited edition essential oil ointments, room mists, body balms, and even herbal teas designed to calm and relax. You won’t just be treating yourself, but also the environment, with biodegradable and recyclable packaging materials used where possible. 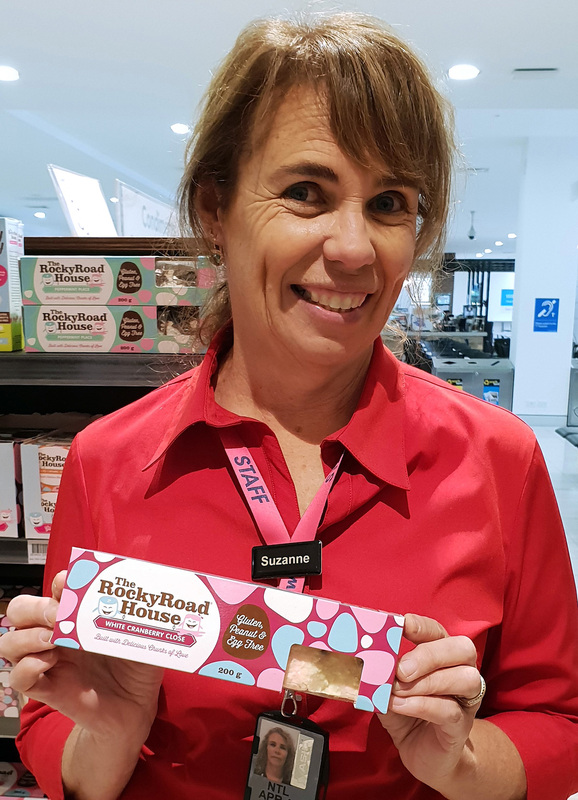 Based in Raymond Terrace, Rocky Road House began with a simple goal by a local mother: to create a delicious, allergy-free version of the Australian classic rocky road. The result? Egg, peanut and gluten-free rocky road treats of various flavours. Traditional chocolate rocky road is just one type on offer, with News Travels also stocking exciting flavours such as Jaffa and Honeycomb Crunch. * One News Travels employee gave us a recommendation on which flavour is her favourite (see right). This is just a selection of the Hunter products stocked in the Departures terminal – there’s plenty more to discover in News Travels’ varied aisles. So on your next trip to out of Newcastle Airport, arrive early and kick back before you take-off with a Hunter shopping experience. For more of the local produce available at Newcastle Airport, check out our blog post on our Snows Artisan Bakery range across all terminal cafes.